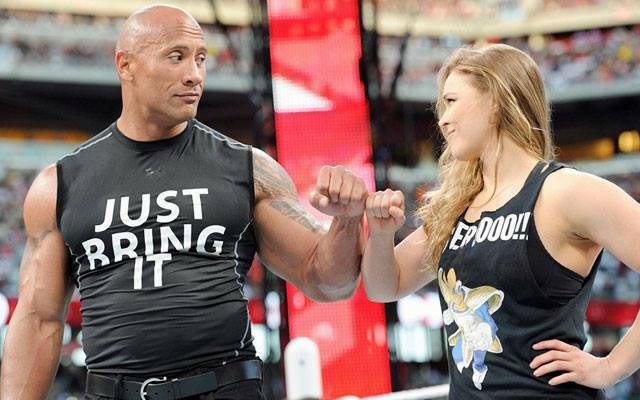 Rock & Ronda? The stage is already being set for a record-breaking WrestleMania 32 in Dallas. This week on The History of Wrestling Podcast, Graham Cawthon, Brad Stutts, & Dan McGinn discuss the involvement of celebrities in building the concept and legacy of WrestleMania and how, because of that, the wrestling industry is more ingrained in pop culture than it ever has been before. They talk recent mainstream coverage by ESPN, SportsCenter, broadcast talk shows, and The Daily Show and compare it to wrestler appearances 25 years ago. Regis, Arsenio, The Tonight Show, and Saturday Night Live all come up in conversation. They also give their thoughts on Sunday’s WrestleMania 31, why it exceeded expectations, and give their predictions on what to expect for WrestleMania 32. Each week, the boys will present their Youtube Clip of The Week. This week’s offering takes a look at an early wrestler appearance on The Conan O’Brien Show as a pushing-the-limit Goldust makes Conan and his security team awkward and uncomfortable back in 1996.